As I mentioned in my last post there are a number of lovely cycle rides that can be taken from the end of the Veloroute du Calavon, towards Cereste & beyond. Having sat down with a neighbour she spent an hour poring over the map, pointing out quite a number of gentle, slightly challenging & rather hard rides that we need to try over the coming weeks & months. 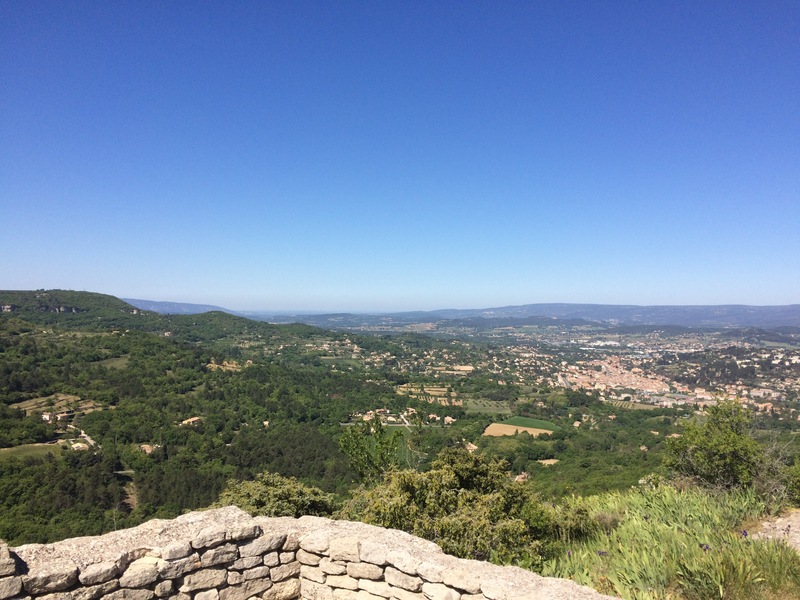 For now though there is a much shorter, but hilly route that climbs above the Veloroute, heading back towards Apt, via the pretty hill-top villages of Castellet, Auribeau and ultimately Saignon. 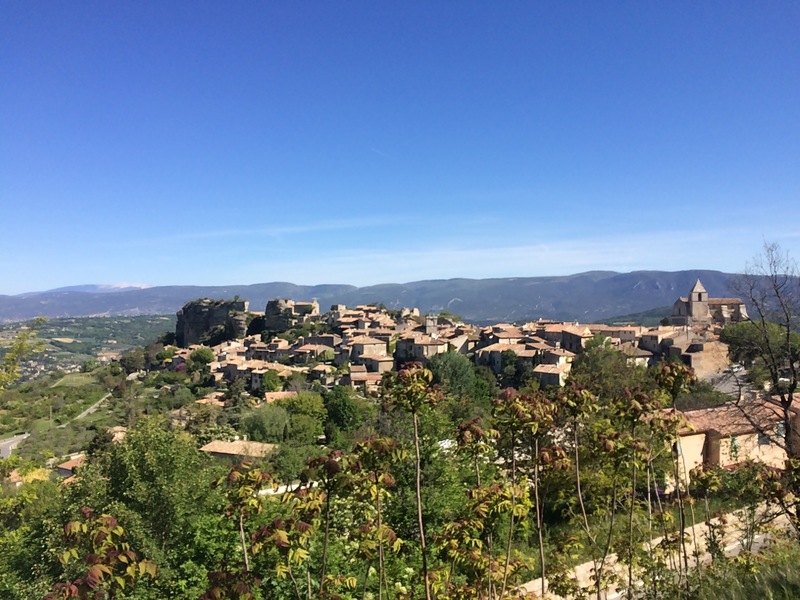 Turning right off the cycle path, you continue on the road, climbing gently over a few kilometres to arrive in the peaceful village of Castellet, with stunning views beyond Cereste towards the snow-capped Alps. 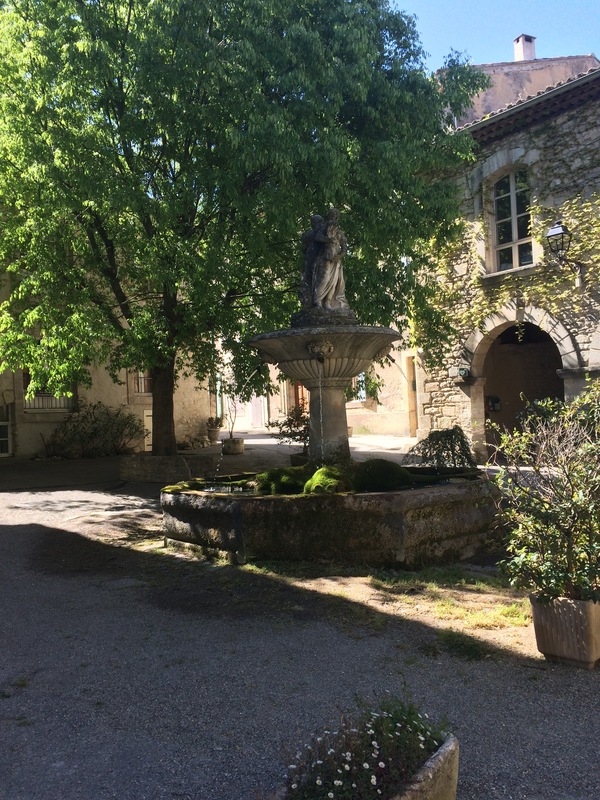 …….. Before continuing on towards Saignon. 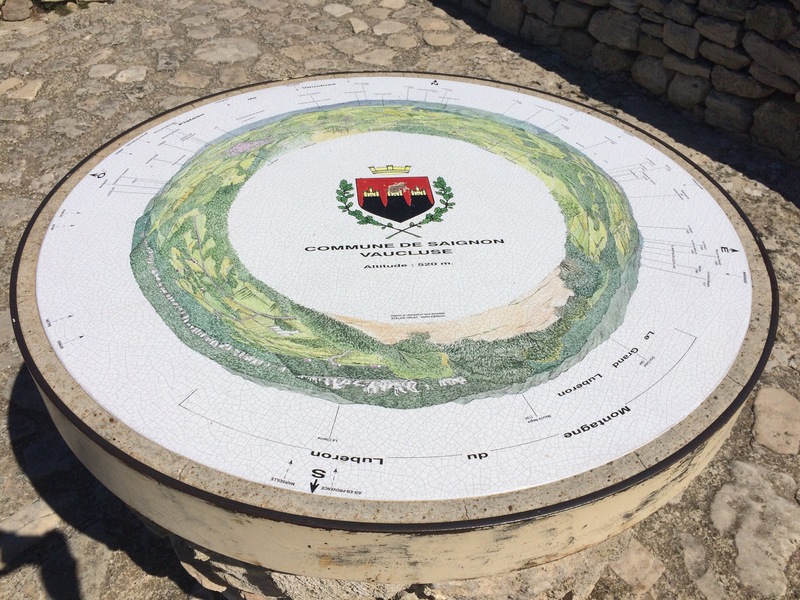 Along this road, you pass a small parking area from which there are footpaths that lead to the summit of the Mourre Nègre, the highest point of the Luberon, from which ( on clear days) you can see the Mediterranean in the far distance. I’m told there is some fantastic mountain-biking around here, but that’s something for my boys, rather than me! 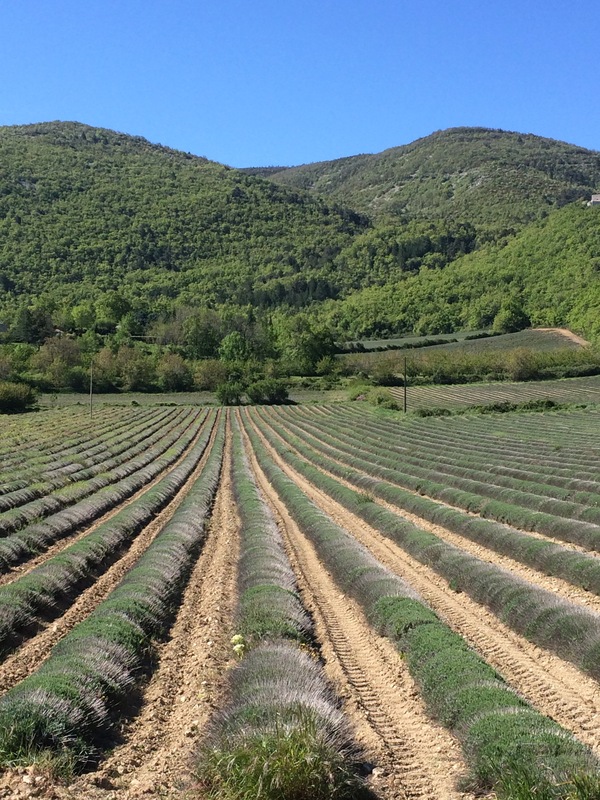 The road continues to run along the contours of the hillside, giving great views across towards Mont Ventoux on one side and the Alps on the other, before there is a lovely little gentle downhill into Saignon. I have a real soft spot for Saignon, which sits above Apt and has a small producers’ market on Thursday mornings. The village has a wonderful, peaceful feel to it and it’s lovely to wander through the quiet streets towards the ‘Rochers’, which dominate the skyline above Apt. ..With an orientation table to help you understand what you can see. The village itself is very pretty, and never seems to be packed with visitors. 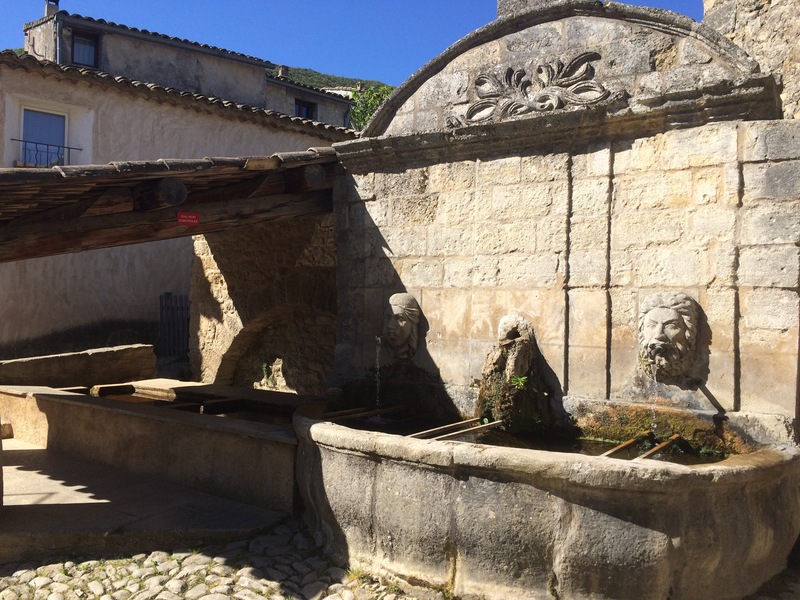 There are some beautiful old buildings & a shady square, which is home to a wonderfully moss covered stone fountain, near which is the old lavoir. 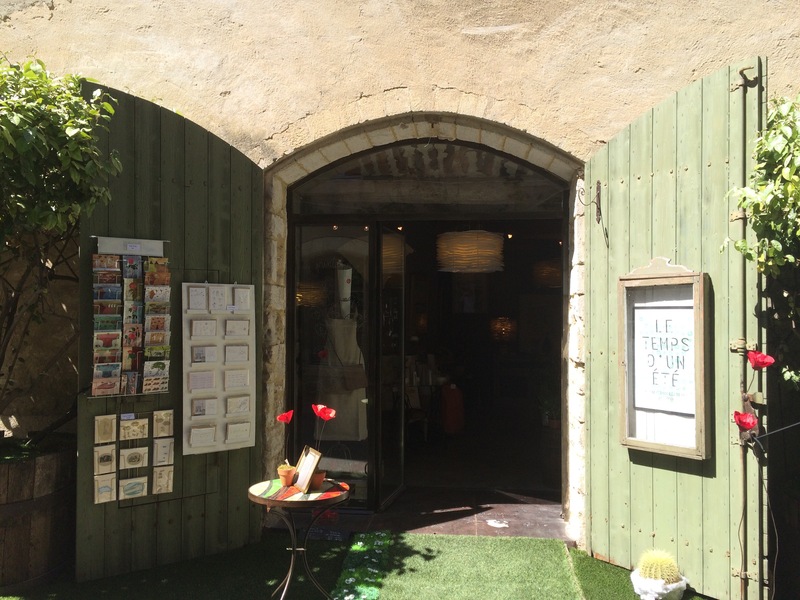 There are a selection of restaurants and cafés with an art ‘exposition’ and a recently opened craft shop ‘Le Temps D’un Été’ which has a great collection of unusual handmade items, from wirework to paintings & cushions to furniture. The shop is open during the summer weekends and over French holiday periods and is well worth looking in if you are looking for something a bit different. 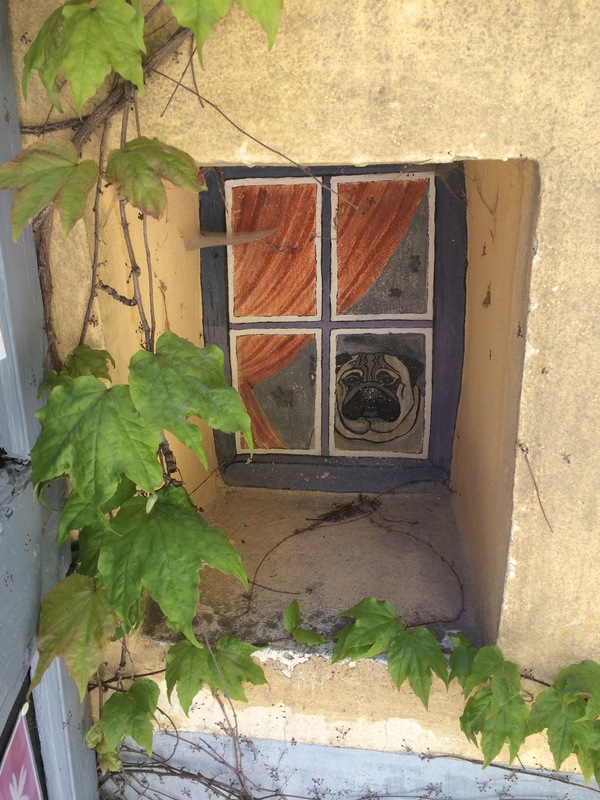 …… Or the painted pug hidden behind a shutter….. 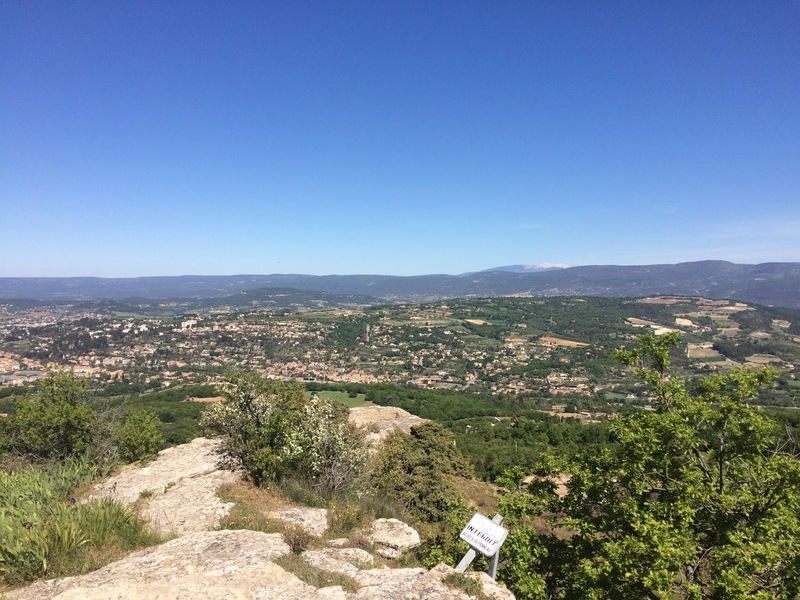 The cycle down from Saignon in any direction is great fun and from Apt you can easily rejoin the Veloroute and head back in safety to your starting point. Happily it’s only a relatively short ride from our house so I’ll be heading there quite regularly, if only to clamber onto the rocks, relax & watch the shadows shift across the valley below. 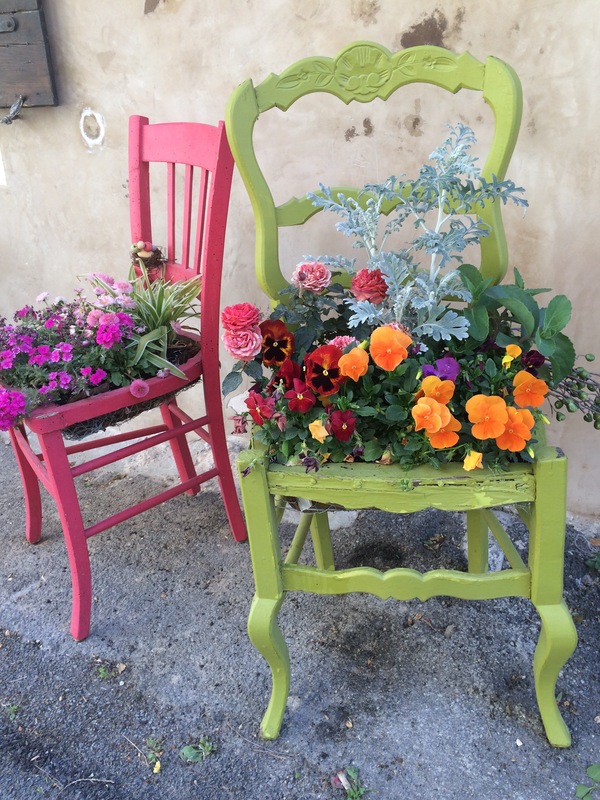 Love the village of Saignon. We stayed there one year and now always go back to wander the streets. So peaceful and relaxing. It is a really gentle place & always so much quieter than most of the other villages in the valley – I popped up there again today & had a coffee in one of the bistrots – another shop was open selling beautiful handmade hats & shoes – another reason to pop back I think! It is a real bonus that so much of your exploring can be done by bike. Good on you for not being put off by the steep climbs to the perched villages! 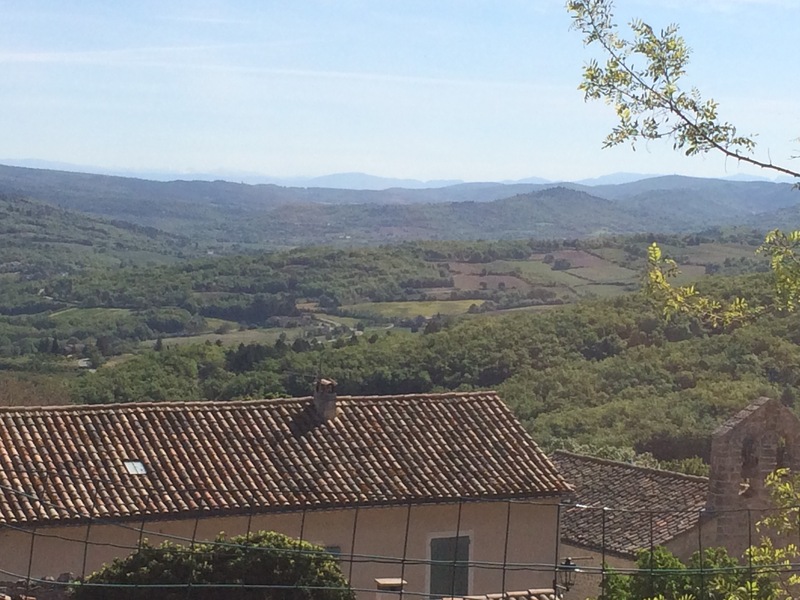 The cycling here is wonderful & the perched villages are always worth the effort, but of course you then get the real bonus of great downhills! I am occasionally heard shouting ‘weeeeeeeeeeee’ as I come down! 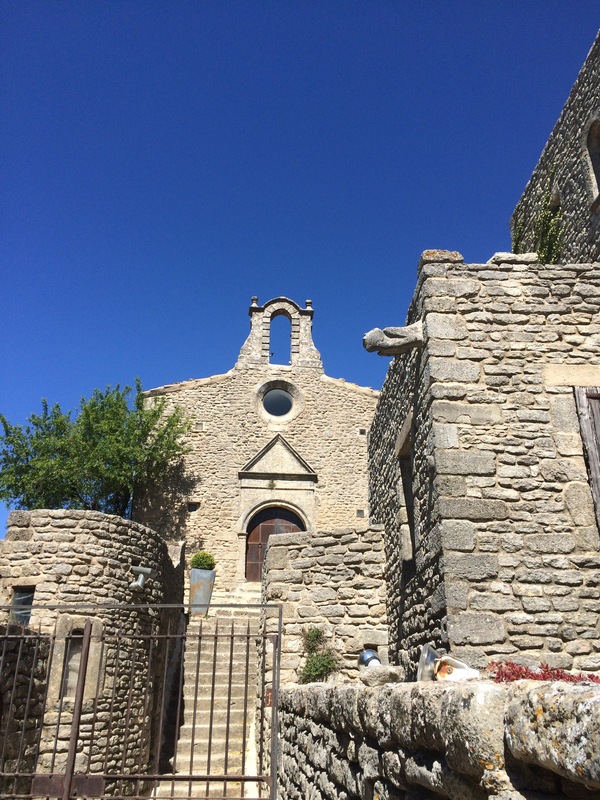 Interesting to note that the old chapel in Saignon is owned by Brits.Have had the pleasure of dining there several times.